On sale now from Apple Newsstand, the latest edition of the world’s first digital-only comics magazine, packed to bursting with reviews and galleries and previews. There’s also news, a look at the week ahead, an exclusive interview with Peter Milligan about Doop and a special preview of a new UK project planning to resurrect a whole host of long-forgotten characters. 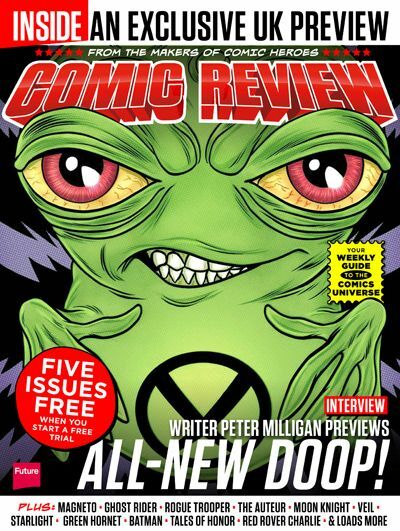 Discover why thousands of people are reading Comic Review every week already by sampling it for free! Comic Review , available for iPad, iPhone and iPod Touch, can be found in the Comic Heroes app now and is FREE every Friday to new and existing Comic Heroes subscribers!